Your dog needs a healthy skin, a healthy body and healthy joints and bones. Right here you'll find our highest recommendations for keeping your dog's skin healthy and your dog's coat shiny. You'll find all-natural dog treats for your dog's health and wellness, and if dog care for you means keeping arthritis at bay, you've also come to the right place. And not only older dogs suffer from hip dysplasia, dog arthritis or other dog joint problems. and from the outside in! Fatty Acids for your dog - Omega 3, 6 and 9 - what your dog's skin needs for a really healthy coat - your dog's coat will shine, your dog grooming will be a breeze, and your dog will be healthy from the inside out! For healthy dog food and premium dog food, click here. For healthy dog treats, look below! Healthy Pet Net Treats Which Are Great For Your Dog's Teeth! Sticks, stones and indestructible bones can do a real number on our pets' mouths. A great alternative for pets is giving them crunchy treats. The act of chewing is very natural and not to mention therapeutic for dogs. It can relieve frustration, anxiety, stress and boredom. Crunchy treats work on different levels. Crunchy treats produce saliva, a natural cleaner of teeth. They have a naturally abrasive action. We at HealthyPetNet have a variety of treats that are wonderful for the oral health of our dogs. Here, we will highlight three of them. These bones are made of pure porkhide and nothing else. They are 100% edible but they are durable, meant to last. The more they are in the mouth, the more saliva … plus they help clean the teeth because the bone rubs along the teeth and gums. They are digestible, safe and yummy! 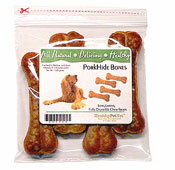 Perfect for jubilant chewers, they are also good for dogs that are prone to boredom. While chomping on these robust treats, your dog will experience prolonged enjoyment while unknowingly cleaning his teeth. The bones come in two different sizes: one size that's perfect for small to medium sized dogs and one that works for medium to large sized dogs. The shape of the bones fit inside of the mouth perfectly and the rounded edges are easy on the gums. 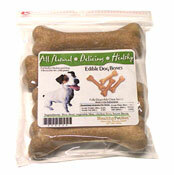 Back by popular demand, our Edible Dog Bones are a delicious blend of rice, flour, vegetable fiber and chicken liver. The texture is crunchy and the ends rounded to promote healthy teeth and gums. Real bones can splinter and get lodged in the throat or the digestive system. They also have a tendency to wear down tooth enamel. Our edible bones are exact replicas of real bones except they taste much better. We know that in the end, the taste is all that dogs care about. The bacon flavor of these treats is irresistible. Plus, for your convenience, we have new packaging with a convenient reclosable zipper to help keep them fresher longer. These treats also come in two different sizes to cater to any size dog. When it comes to teeth and gums, these are popular treats. These treats, unlike any other, contain a patented plaque fighting ingredient found in human oral hygiene products. It works by building a coating around the teeth that discourages the buildup of plaque. 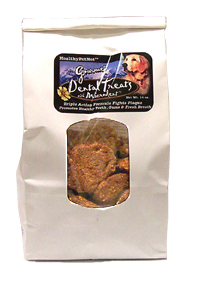 Our Gourmet Dental Treats also contain calcium and phosphorous, which are good for strong bones and teeth. We've also added parsley, an herb rich in chlorophyll that has a natural power to freshen breath. Parsley has many other health benefits, containing vitamins A, B C and K.
Some of the ingredients aside from the ones just mentioned include rolled oats, honey, brown rice, flax seed meal, peanut butter and eggs. These treats are not only useful, but delicious. In a university study, dogs chose our Gourmet Dental Treats 4 to 1 over the leading brand of dog treat. The best part about it is they don't even know it's good for them! - ALL DOGS CAN BE AFFECTED! 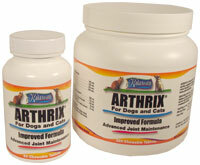 For a dog's joints that ache, or if your dog has stiff joints, or if your dog has trouble getting up from a lying position, or if your dog seems to be in any pain when he walks or runs, your dog care solution may well be Arthrix, an arthritis care for dogs.